I've mentioned before that we are a bit close to the road. Adam has a plan for that. We did put in those rose bushes, six of them. 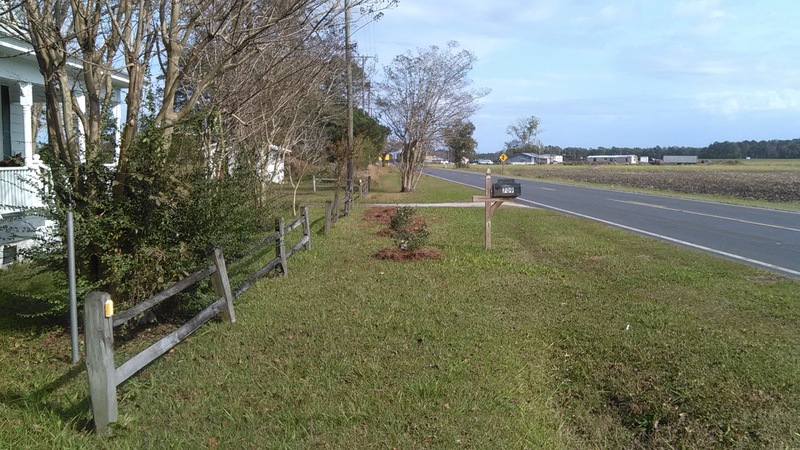 When we were clearing the orchard Adam noticed some weed trees there that looked promising to serve as barrier trees between the house and the road. We wanted trees that would sit between the wooden fence and the rose bushes, all in a line like the roses. 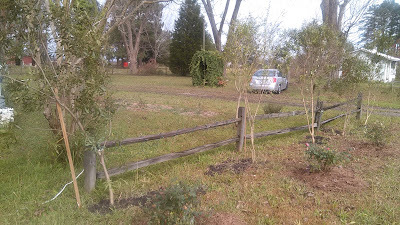 The fence will eventually be moved and go around Anna's little house. The trees he noticed are wax myrtles or swamp myrtles. 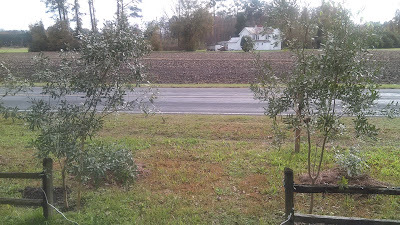 Many folks prune the bottom branches, but I think we'll leave ours as full as possible for maximum obscuring of the road. We want privacy and a sound barrier. 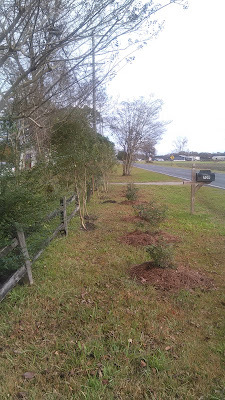 The huge advantage of these trees is that we have lots of them -- dozens, probably -- and that they are free. Are there other trees that might be a better barrier? Sure. Do we want to buy them? No. 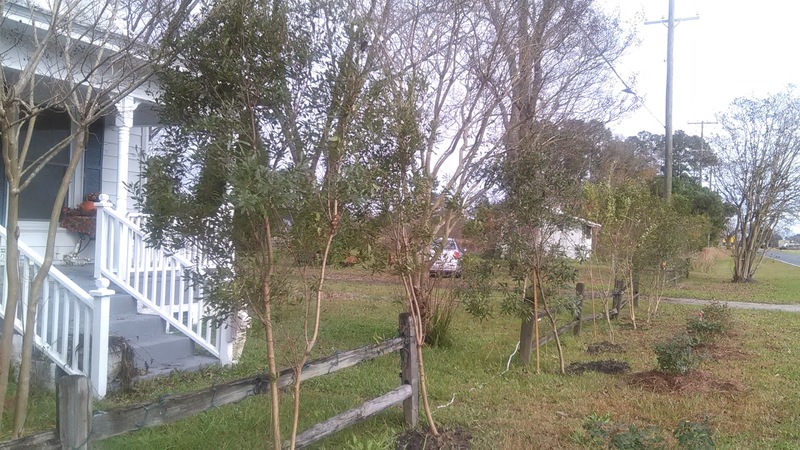 I was at a friend's house recently and she has these myrtles in a small section of her yard. They are quite interesting (beautiful trunks) and lovely to look at. I'm pleased we have them. Already they are giving a little barrier, if you look down the fence a bit. But from the front, they are certainly spindly. These are 6 - 8 feet tall. Adam read about transplanting them. This is a good time of year for it. They thrive as weeds do, and need little water this time of year. 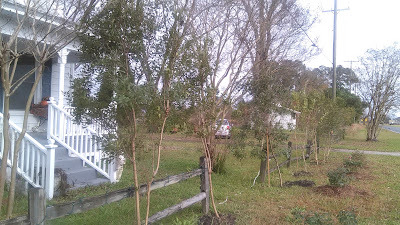 In the photo below, you see the wax myrtles in front, and the crepe myrtles behind. 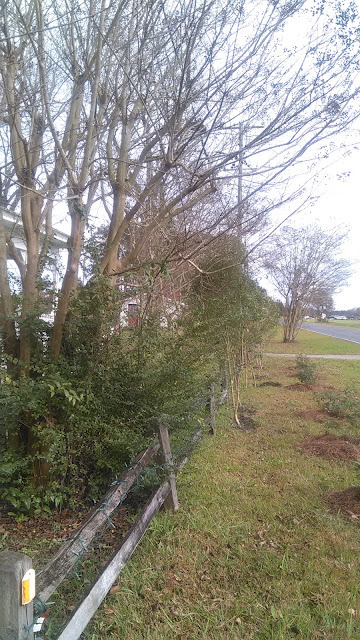 Adam dislikes crepe myrtles, and eventually hopes to take almost all these out. They take up space, shade other plants, but don't give us any barrier to the road because they've been trimmed heavily on their lower portions. They don't feed bees. 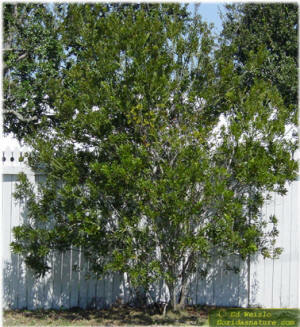 The wax myrtles can supply wax (from its fruit) to make bayberry candles. And apparently they repel insects too! It's very pretty at night. Today he's so busy: 1) working on a broken electrical system to the barn, 2) trying to address our significant field mice problem, 3) fixing a front tire on the van, 4) installing a new stove that some very kind person gave us (!!!! ), 5) wishing he could decorate the front porch, but #1-4 are too pressing. I have to go to work soon, so I'm little help, although I did just make a batch of soap: sandalwood, eucalyptus/lavender, linen, magnolia, chocolate/coffee, vanilla, and moonlight musk. These will be ready about Christmastime, but they are not holiday scents, so they will mostly sell next year. Your trees look like they'll do the job! Yay! Christmas vacation from school will be MUCH appreciated I bet! Love trees for sound and privacy. Free is great too! 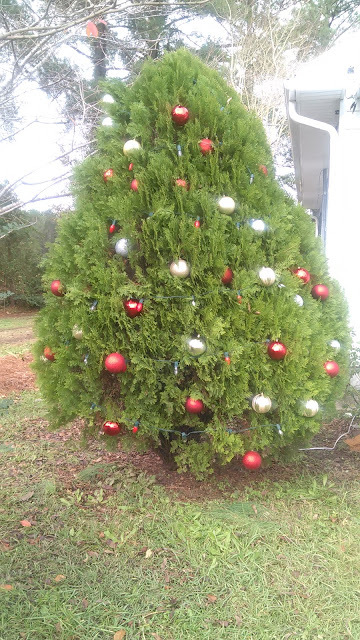 Love the decorated Christmas tree in the yard. This concept of Weed Trees is completely new to me!! Here in the West we have some shrubs that are invasive, but trees - I don't think so...at least I've never heard them referred to in that way.